Electronically weighs and grades hatching eggs to pre-defined weight classifications. Eggs enter the egg grader on an infeed conveyor, where oversized, misshapen, cracked or dirty eggs are removed manually. Egg pressure control switches prevent the eggs from building up on the conveyor. The remaining eggs are transported through infeed gates onto a roller track, between two specially shaped rollers that position the eggs into a queue at the end of the track. Here the eggs are transferred via star-wheels onto an egg lane and guided by elevator shafts towards load-cells, where they are weighed. After weighing, the eggs are guided either towards one of the brush conveyors, or to the packing table, tracked by weight to their correct destination. After weighing, elevator shafts move the egg upwards through the drop station. From here the eggs are transported above two brush conveyors. A manual packing station is typically positioned at the end of the drop station. The brush conveyor receives the eggs from the drop station, a rotating brush and an outfeed conveyor. A packer, packing table or another conveyor may be added to the brush conveyor for further transporting the eggs. Two or three operator-defined egg sizes define three or four weight classes. 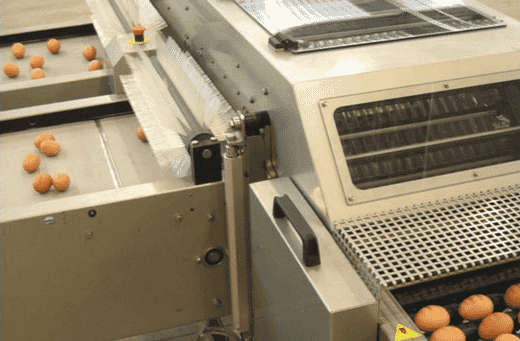 Depending on the configuration of the egg grader and its program, eggs are separated and transferred to two or three outfeed stations.